MEDICINES worth more than US$63000 was destroyed during the recent protests by the Zimbabwe Congress of Trade Unions which claimed lives. The Health and Child Care Parliamentary Portfolio Committee learnt during a tour at NatPharm that a truck worth US$$80 000 loaded with medicines worth US$$63 248 was burnt by protesters during the recent strike. NatPharm managing director Flora Nancy Sifeku told the Parliamentary Portfolio Committee that the truck driver left it parked at Chitungwiza Police Station after protesters threatened motorists to park their vehicles. “As NatPharm, our mandate is to procure, warehouse, distribute and supply medicines,” said Sifeku. “We would like to inform you that NatPharm was not spared by recent disturbances that left properties destroyed. “One of our drivers was forced to park his truck at Chitungwiza Police Station and protesters followed and set the truck on fire and medicines worth more than US$63000 were destroyed. “The medicines were destined to Mashonaland East province,” said Sifeku. 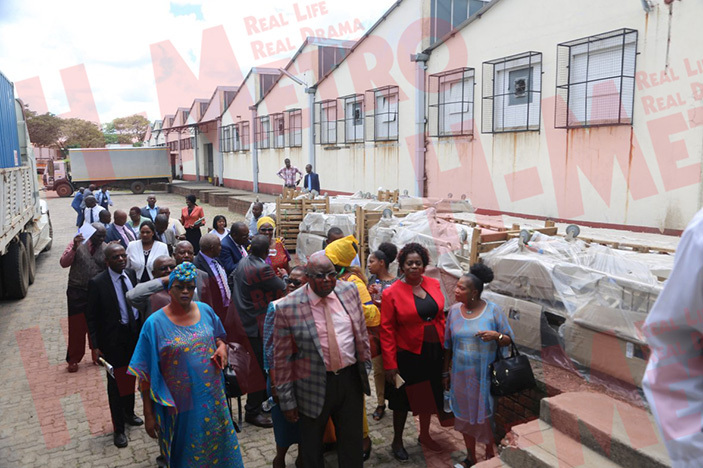 She said NatPharm is faced with challenges of storage space, ART scale up, improved stocking, congested warehouse which makes inventory management a challenge as well as lack of appropriate modern warehouse equipment.